We are typically open the months of March thru December, but will extend our season if the weather allows. View our schedule by clicking here RENTAL RESERVATIONS for the latest schedule or call to see if we can make a specific date available. Can I bring my own gear? Absolutely! We recommend you bring your own gear if you already have it. This way you are wearing something you are already comfortable with. Do you cancel in the event of rain/bad weather? Sometimes. Pending on the weather, we may elect to reschedule a rental session. Lightning storms, extreme heat or excessive cold, and significantly high winds are grounds for rescheduling. We will EMAIL you and post the cancellation on our Facebook page if we decide to postpone the session. It is your responsibility to check your email or our social media to confirm. We will provide a brief review of our policies/rules, an overview/tutorial of the vehicle, some basic training, followed of course by the ATV tour, and finish the activity with a nice photo op. Also included in your rental will be a current, well maintained ATV, full tank of fuel, brand new sanitary head sock, helmet, goggles, and gloves. You only need to provide the pants, shirt, AND NO OPEN TOED SHOES! Our sessions are 1 hour long for the entire the ATV tour riding experience. Throughout the trails tour you will encounter bumps, small hills, log crossings, puddles, water crossings and probably even some mud pits! What type of machines can we choose from? NO! In fact, the majority of our riders have never ridden an ATV before! Our ATV's are super easy to operate with a simple Forward, Neutral, and Reverse transmission. So all you have to do is simply push the lever into forward, ease on the throttle and off you go! No clutch, no gears, just gas and go! If you can ride a bicycle and understand the concept of steering with handlebars, you can ride our ATV's! Absolutely! Women are a large percentage of our rental population! And they have just as much fun getting dirty as the guys... sometimes even more! Can children participate? What is the minimum age to ride/rent an ATV? Yes!!! Small children ages 5-10 can ride as a passenger with a responsible adult. 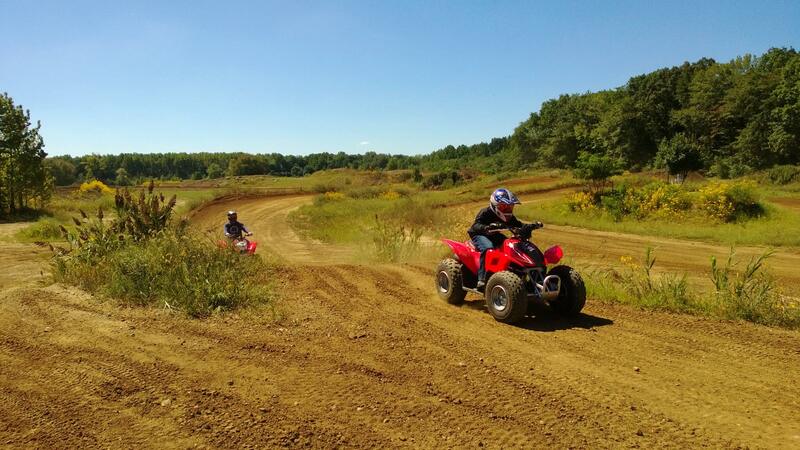 Riders ages 8 and up can participate on their own utilizing our Youth sized ATV's (Ages 8 and up). Simply select the vehicles size (based off of age) during reservation checkout. How many can ride at the same time? At this time, we typically offer group sizes of 8 to 10. However, we can accomodate up to 14 or 15 riders. Please call to make arrangements for groups over 10 riders. Is there any paperwork that needs to be filled out? How about riders under 18? Waiver of Liability Form for Ags 18+ is for ALL to sign. Damage Waiver of Liability Form for ALL Participants is for ALL to sign. Minor Release Form for riders UNDER 18 is required for anyone under the age of 18 to have filled out by the minor and the parent/legal guardian. Minor Participant Authorized Guardian Form is for a minor who will not have a parent or legal guardian to sign them in... If this is the case, a parent must get this form notarized to allow another adult to act as guardian for the day. Do the parents or legal guardians HAVE to be there to sign them in? Should you need to cancel or reschedule your event, simply provide us with a MINIMUM of 72 hours notice prior to your scheduled event and we will gladly refund your entire fee or reschedule your event date. Cancellation requests made within 72 hours of the scheduled event will result in a cancellation fee of $50 for each vehicle that was reserved. Parties arriving with a fewer number of people in reservation will still be charged full price for the total number of vehicles reserved. If your party's headcount changes, you must notify us at least of 72 hours prior to the scheduled event to avoid paying for extra vehicles. Please note, NJ ATV Rentals reserves the right to cancel a reservation due to inclement weather. Events cancelled due to inclement weather will be rescheduled at no charge. PLEASE ALSO NOTE- All sessions will end at the scheduled end time! Therefore, if you show up late, we will NOT be able to extend your session due to your late arrival. Nor will you be entitled to reschedule or a refund. It is your responsibility to arrive on time. Please be sure to plan your trip accordingly and arrive on time. We will NOT be liable to accommodate parties arriving 15 minutes later than their scheduled start time. Therefore, anyone arriving 15 minutes past their scheduled activity start time agrees to forfeit their deposit and riding time. If, and ONLY IF, there is availability in a later session that day, will we be able to move you to a later session (that day ONLY) with a mandatory $10 transfer fee per person. It is your responsibility to arrive on time. Riders who arrive under the influence WILL NOT be permitted to ride, will forfeit their payment, and be asked to leave. We thank you for your business and look forward to providing you a fun filled adventure! What is involved? Can you explain how it works? Sure, it is as easy as... Make your reservation. You are now guaranteed to have vehicles for that particular date and time. Arrive 30 minutes early to get checked in by signing release forms, select gear, etc. At your activity start time, we will begin our policy/procedure chat and ATV overview explanation/demo, followed by tesingt your skills in our range area to prove you can control the vehicle. After that, the real fun begins with your ATV experience! Do you have any souvenirs to purchase? We typically carry small, medium, and large jerseys and Tee Shirts that can be purchased and act as wonderful souvenirs. Some even like to purchase them before they ride to get them more "into the groove". For sure! We cannot allow someone into the trails, but if someone would like to take pictures from "the sidelines" before or after the tour, they are more than welcome! We like to take pictures as well throughout the sessions... they can be found on our Facebook page for your viewing pleasure. Feel free to Like and Share your pictures as well as our Facebook page to help spread the love. What if we damage a vehicle? Riders are responsible for ANY AND ALL damage they cause to the vehicle! We reserve the right to charge the credit card on file for for any damage caused by any renter included in that reservation. NJ ATV Rentals Staff reserves the right to ask a rider to leave if he/she is posing a threat to themselves or others WITHOUT a refund. And remember, "Roll it over, your session is over!" Do you do Bachelor Parties/Birthday Parties, Team Building, & Corporate Events? We most certainly do, and quite often as a matter of fact! Please call for details if you are interested in booking a large event. What if people are riding reckless? We have a TWO STRIKE YOU'RE OUT policy! This means you will receive ONE WARNING (and one warning only)! If our staff has to stop you again, you will simply be asked to leave and you will forfeit your rental fee and remaining time in that particular session. Safety is our number one priority! For your convenience, our RENTAL RESERVATIONS page allows you to reserve vehicles and book a session directly through our website with just a 50% deposit! What we always suggest is to check out our schedule and compare it to yours. Once you see a date that works with your schedule, go ahead and book it online right away. You can always give us a call to arrange for a session over the phone. However, we always recommend you book it through our website as soon as you see it is available to guarantee that particular date and time. Keep in mind, the reservation page is "Live" meaning, anybody can book a session at any time. So if you snooze, you may lose the date/time you had wanted. Pleas see the following link for our rules which are strictly enformced. I still have more questions or would like to discuss in person.